Head coach Alan Stubbs says it will "be an uphill challenge" for Hibernian to win the Championship but insists they can claw back their deficit. Wednesday's 3-0 home defeat by Morton left Hibs eight points behind leaders Rangers with 11 games remaining. "It certainly doesn't make it any easier but we have been eight behind before and we managed to claw it back," Stubbs told BBC Scotland. "We'll keep going, as we have done all season." 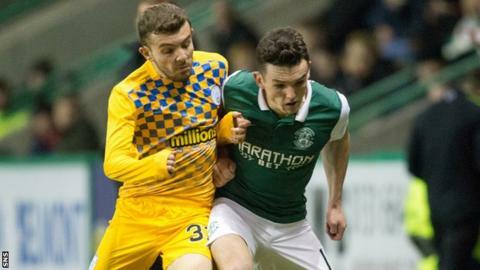 Hibs had not lost at home in all competitions since July and they travel to face Dumbarton on Saturday before visiting Queen of the South on Tuesday. Stubbs' men then have a Scottish Cup quarter-final with Inverness followed by the League Cup final against Ross County. Only the Championship's winners will gain automatic promotion to the Premiership, with the sides finishing second, third and fourth going into the play-offs. "Tonight is a blow, it's a blip," said Stubbs. "It's going to be an uphill challenge but we'll obviously give it our best shot until the end of the season. "We've been fantastic for the majority of the season and it's disappointing when you lose a game of football. "I've got to say I've not been in this position a lot of times this season and that's where the players deserve a lot of credit. "They've not performed as well as what they have done and they're as disappointed as anybody but the good thing is we go again on Saturday and we've got a lot to play for. "They know they've dropped below their levels tonight. We've had chances and unfortunately we haven't taken them. When Morton had chances they've taken them and all credit to them. "I don't want to take anything away from them. It's a great result for them, it's a poor result for us." The hosts had opportunities, most notably Jason Cummings with a close-range header, before Thomas O'Ware, Denny Johnstone and Ross Forbes netted for Jim Duffy's visitors. "We started the game okay then we had a period when we had a couple of half-chances," Stubbs explained. "Jason's one in the middle of the goal, he should score but that probably summed the night up, really. "We just lacked a little bit of urgency. I thought we made too many wrong decisions." Morton boss Duffy lauded his side's display after they moved to within a point of the promotion play-off places. "It was an outstanding performance from the team," he said. "Overall, I didn't think we had a failure. I think everybody deserves the credit. "To win in the manner we did, we're absolutely thrilled."